They are young, full of beans and very restless. And they are either quietly moving into family business, or starting up their own. In her growing-up years, Lara Balsara— like most of us—wasn’t sure about too many things, but what she was pretty clear about— unlike many of us—is that she did not want to be a doctor or an engineer. That may not come as surprise to those who know her father, Sam Balsara, a doyen of the Indian advertising industry, and Chairman of the Rs 1,300-crore (gross annual billings) Madison Communications. “Talking to dad about his work, about advertising, brands and communication on a regular basis got me interested in marketing and advertising,” says the 26-year-old Business Development and Diversification Manager at the 19-year-old diversified communications group. After a BA (economics) from St Xavier’s College, Mumbai and a 4-5 month stint at Madison, Lara headed to the UK for her Masters in Marketing from Bristol University. Now four years old in the organisation, Lara has been responsible for some key business units taking shape. These include Madison Teamworks & Entertainment Services (MATES, the branded entertainment entity), Madison Retail Paradigm (MRP) and Madison RKD retail/iQ. But Lara’s main mission is building the organisation. “My journey so far has been exciting but I have a long way to go yet and I want to take Madison to great heights.” Keep an eye on her. If the name Ashni Biyani does not sound familiar to you, that's because the daughter of Kishore Biyani, Group CEO, Future Group, has things to do. The Future Group’s ‘Innovation & Incubation’ division is where this young lady officially got her feet wet in the day-to-day functions of the Group. Ashni schooled at Queen Mary’s, and did two years at H.R. College, both in Mumbai. This was followed by a course in textile design at Bangalore’s Shrishti School of Art & Design, another in Design Management at the Parson’s School of Design in New York and a General Business Program at Stanford. And she’s just 22, although Ashni is fond of reminding people that she has actually been working in the business for the last 22 years. “Dad’s work has never been like ‘work’ for us; it’s been a part of our lives. Even now, there is no disconnect between the Group and our personal lives and I love it because it’s like that.” Another bonus is that she has many mentors and guides within Future Group egging her on. As far as her designation within the company goes, Ashni thinks it’s ‘Design Manager’, but is “not too sure” of that either. And that doesn’t bother her; because she firmly believes that it’s about what you’re doing that would define what your role is. “The way I see myself in the group is not only about what I’m doing today. I’m here not to do everyday work, but to look beyond in terms of thought leadership and to take the Group to the next level.” Yes, she’s only 22! When brothers split, it’s time for the daughters to come to the fore. It’s been that way at Parle Agro, ever since the brothers Chauhan, Ramesh and Prakash, decided to go their own ways. 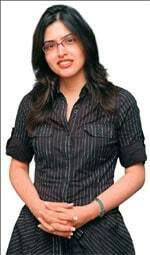 First to hop on board was Schauna Chauhan Saluja, 31, now the CEO of Parle Agro: “I stepped in at a time when restructuring (this was after the brothers separated and split the business between themselves) was about to get over and there was a huge vacuum in the company.” After graduating in business management from Switzerland in February 1999, Schauna joined the business. Today, she’s in the thick of day-to-day operations. Chauhan sisters began way back during their school days. “Since childhood our father used to bring us to office and make us sit with him in business meetings. His idea was if we could even gather 1 per cent of what was happening in his meetings, we stood to gain huge insight,” says Nadia, the youngest sister, who graduated from HR College of Commerce in Mumbai. Today she heads the marketing & sales team, which handles everything from conceptualising the product to advertising, marketing and sales. points out, systems had to be put in place. “I still remember when I joined in 1999 there wasn’t an HR department, not even a proper logistics department.” Her father gave her a free hand. His only note of caution: Be patient with people around you. “Initially, I was bursting with new ideas, but he cautioned me that I have to carefully take my steps so that I don’t hurt any emotions. After all people are important for any business,” says Schauna, who has been aggressive with growth. In the last eight years employee strength has risen five-fold to 1,500, and manufacturing units have increased from just one in 1999 to six in 2007. Over the next three years, she wants to upgrade all the plants, automate all facilities and focus on international sales. Meantime, Parle has forayed into confectionery, a business led by Nadia. “In confectionery, distribution plays a major role and the intention to get into the business was purely to learn the skills of distribution and how to save costs in our beverages business (which includes brands like Frooti and Appy),” says Nadia. “Our biggest challenge is to bring down costs and improve margins in Parle Agro,” adds Schauna. Going against the grain, 29-year-old Alisha who completed her Bachelors in Business Management (BBA) in 2000 from Australia opted to step out on her own. She’s made passion a business by opening a chain of health and fitness centres, branded V3. Today it is a two-branch network that’s restricted to Mumbai. But as Alisha reveals: “We have plans to take V3 nationwide.” She’s ventured into an unrelated business but the Parle aggro is amply visible. If the preceding three generations of your family dabbled in the same business, it’s unlikely that the fourth generation would veer off the tested track. Not at least if you are Bhairavi Jani, daughter of Tushar Jani, former Chairman of logistics major Blue Dart (in late 2004 Global Express and logistics giant DHL acquired Blue Dart). The 28-year-old science graduate from Miami University, Ohio, had a liking for the business right from childhood, and always wanted to do something in the supply chain management space. And that’s exactly what she’s doing. She set up i3pl, a fourth-party logistics company (a fourth-party firm that typically plans and controls all logistic procedures with long-term strategic objectives from procurement to production to distribution of goods & services). With, of course, plenty of help from her father. “No MBA is better than a father’s MBA,” quips Bhairavi, who started her career as a summer trainee in the operations department of Blue Dart under Ms Cooper (Farida Cooper, wife of Blue Dart co-founder Clyde Cooper, who handled operations). Her father for his part returns the compliment. “Today I work for my daughter,” says the Chairman of the SCA group of companies. After graduating in 1999, Bhairavi joined KPMG’s Washington DC office as a supply chain consultant. When she returned to India, her father wasn’t too keen on her joining the family business. Instead she was told to build her own venture. “I never understood then why my father didn’t allow me into the business. Now I do. The entrepreneurial experience and a free hand have helped me take tough decisions,” she explains. To be sure, it wasn’t easy in the early days. Bhairavi had to pick up from scratch the fundamentals of the business, right from container clearing at the port, to warehousing, to delivery of goods. It didn’t help that few were willing to give her a chance. “The path wasn’t easy with people not taking women seriously in our business,” says Bhairavi. Today, with a team of 50 employees, warehouses in five major cities, and a host of high-profile clients—such as Mahindra & Mahindra, Lego, Frito-Lays, Sara Lee, Airtel and Asian Paints—few can afford not to take her seriously. Her progress impressed the SCA Chairman too. “Once she had established her credentials we roped her into the business, and today she is the link between the board and the professionals at the SCA group,” says Jani. The SCA group has four companies, which are in the business of inventory management, supply chain technology, cargo handling and warehousing. Says Bhairavi: “My role has evolved. I am involved in building new strategies for the group and guiding professionals to execute these strategies.” She’s got a vision for the future, too— to get into energy logistics and distribution, and set up logistics parks in the country, which will cater to all needs of supply chain management under one location. PNC in its full form is of course Pritish Nandy Communications, a company that is involved in film making. Rangita for her part was always keen on media and advertising, which is why she enrolled herself for a vocational course in advertising, sales, promotional sales and marketing at H.R. College of Commerce. An internship with Ogilvy & Mather was followed up with the stint at Percept. Today, Rangita has progressed from trainee to creative head of the firm. And she attributes her progress to her father’s instruction methods, not all of which were conventional. “He is a monster at work, as he just dunks you in the deepest waters, hopes there are plenty of piranhas around and expects you to learn how to swim and if possible fly at the same time. But thank God for him; I would have been a vegetable without him around.” But it’s such training that’s helped Rangita add value to PNC. In the past she been the producer for Bollywood films like Sur, Chameli, Jhankaar Beats, Shabd and Pyar Ke Side Effects. One of the first things Dr Prathap C. Reddy taught his daughters, when they were kids, was swimming. But that would have been just the first time that the Chairman of the Apollo Hospitals group of companies dumped them at the deep end. He did it again when the four—Preetha Reddy, 50, Suneeta Reddy, 49, Shobana Kamineni, 46, and Sangita Reddy, 45—wet their feet in the world of business. Either swim or sink was the decree. And swim they have—in style, with substance, and in spectacular fashion. Together, the four pack a punch that makes the Apollo Hospitals group a force to reckon with. 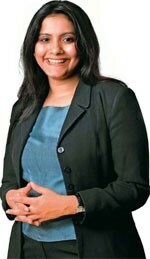 Preetha, the eldest, is the Managing Director of the group. Sangita, the youngest, heads the human resources function at the group (Executive Director, Operations) along with the BPO & IT solutions. 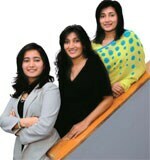 Suneeta, Executive Director, Finance at the group level, is the finance whiz, and Shobana, who heads the pharmacy and insurance arms, is whole-time director at Apollo Pharmacy and Apollo DKV (their newly formed insurance company). One of the most precious lessons their father could have taught them was to learn about an individual’s capability, then have the ability to give responsibility to them, and believe in their ability to deliver. “Today when I talk scale and say I am doing one pharmacy every 22 hours it is because he has taught us to believe in ourselves,” explains Shobana. From a pharmacy retail store chain of just 270 stores last year, these retail stores of Apollo are today close to 500 and she hopes to hit 1,200 by early 2009. Shobana has clear goals for the pharmacy and insurance businesses: A top line of Rs 1,500 crore by 2010 (last year it stood at Rs 460 crore). The figures include both pharmacy retail stores and its hospital-based pharmacy sales. In insurance, the goal is Rs 1,000 crore by 2011.